I miss my girls. I think I'm going to start watching the DVDs over again. I'm sick of TV and we decided to turn off our cable. I'm going to miss my guilty pleasures, The Hills, Rock of Love and Clean House, but I think Gilmore Girls will make me happier. Oh, I'm also going to miss my house fixer-upper shows. I like to complain about how they are modernizing them. I'm not a fan of granite countertops and tavertine tiles. I cringe when they tear the old tile out of the bathrooms and replace it with junk. My family home has a pink tiled bathroom that I love. 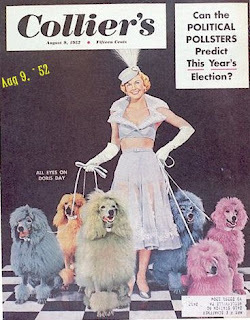 When we were young it had wallpaper with poodles sitting at dressing tables. I loved that wallpaper. That bathroom is my favorite part of that house. I was actually watching one of my Gilmore Girls DVDs when I decided to take a break and check out your blog just a few minutes ago. I watch at least one episode every day sometimes more. It doesn't matter how many times I have seen the episodes I still cry at the sad moments and laugh like crazy at the funny moments. Kev thinks I am crazy to be able to watch them over and over. Having said that, we didn't have cable during season 7 and that is the only season I don't own. I have absolutely no idea what happens during season 7. I want to be able to watch them in order so I refuse to watch reruns on TV. The wait is driving me crazy. Season 7 makes me sad. But you still need to see it. I can't stand Logan and Christopher. I think you will really love the girls. What things you have to look foward to. You're Grammothers bathroom sounds lovely. I still wear the vintage slips from one of your grandmothers. I love them. 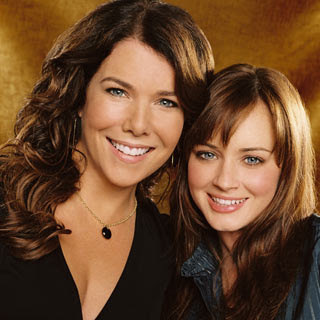 Oh how I love those Gilmore Girls. When I lived alone I had to have the DVD's playing to go to bed. I haven't bought season 7 yet, otherwise I have them all. I tried to burn you a copy of Flight of the Conchords but I couldn't figure it out. If you have a VCR let me know and I can hook you up! We have the first season of The Flight of the Choncords. That was so sweet of you to think of that. They make me happy. Well Jermaine does. 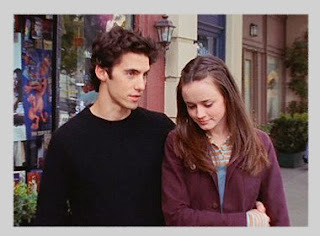 I'm watching Gilmore Girls season 7 right now. I get really irritated with it (I think it's the most irritating season) but I love having it on while im doing things around the house. It feels more homey that way. I got mine at Target for 25 bucks. They go on sale every couple months there. You're the best.